It’s time to run the dishwasher and the thought pops into your head, “Am I using the best dishwasher detergent?” Join the club – we all ask ourselves that question. We have the scoop on dishwasher liquid vs dishwasher powder and will give you a clearer picture of what the differences are between the two. 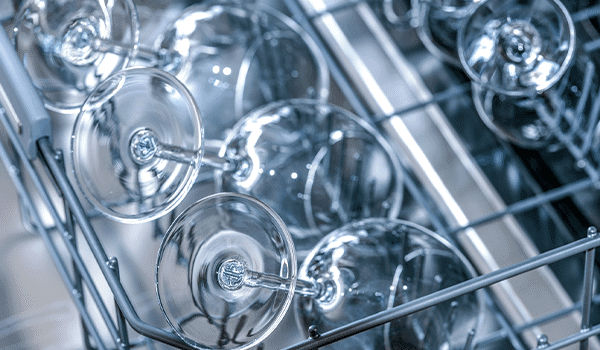 There are generally two main types of dish detergent: dishwasher liquid vs dishwasher powder. Many people don’t really know how each detergent performs in cleanliness, let alone how each one affects your dishwasher, or which detergent is the most eco-friendly. Let’s explore some details about which is considered to be the best dishwasher detergent to get those dishes sparkling clean – you can dish up the detergent you believe wins the debate. Dishwasher liquid vs dishwasher powder function differently. Although both will get dishes clean, dishwasher powder has an advantage in that it contains both bleach and enzymes. Bleach takes care of stains like coffee and tea on your dishes, whereas enzymes break down the proteins and stuck-on food left on the dishes during the wash. Ideally, you want both of these components in your detergent. Having only bleach present isn’t going to get rid of the starchy residue left from some foods. Conversely, having only enzymes present isn’t going to take care of coffee and wine stains very well. For these reasons, dishwasher powder tends to clean more effectively. In addition, dishwasher liquid can get sticky around the dishwasher parts impairing their function. 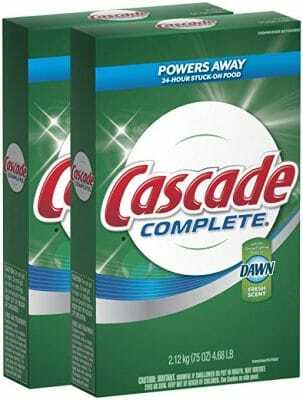 Powders like Cascade Complete often clean better. Which is easier to use and better for the environment? Liquid detergent is sometimes preferred for ease of use and the ability to mix immediately with the water. However, liquid bleach eats up enzymes, so they don’t play nice together in a storage bottle. This means that both cannot be present. Liquid detergents also tend to contain more chemicals to boost their cleaning power, so they have to be packaged in more heavy-duty plastic. The bottle they’re packaged in leaves more of a footprint in our landfills. Powder detergents are a little messier and need warm water to dissolve completely. If you have a subpar dishwasher or hard water that doesn’t want to dissolve those powder crystals very well, you may need to make the “hot start option” your dishwashing norm. 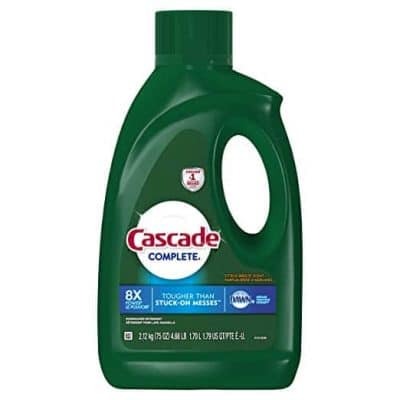 On the upside, not only do powder detergents clean well when tackling both stains and food deposits, but the packaging for powder detergents is more environmentally friendly as well. Powder detergent boxes are able to use recyclable materials which is friendly to mother earth. Regarding dishwasher liquid vs dishwasher powder for ease of use and environmental impact, there is a divide. Liquid wins for ease, powder wins for environmental friendliness. Liquid dishwasher detergent can be easier to use. In comparing the costs of dishwasher liquid vs dishwasher powder, the powder is a more economical choice. There is also one option that incorporates both the liquid/gel and the powder detergent together – dishwasher detergent pacs. Sadly, dishwasher pacs can be up to double the cost of their individual counterparts but may be justified since you get the best of both worlds with efficacy. There is no denying their ease of use, typically they take up less storage under the kitchen sink, and do a fantastic job of cleaning dishes. 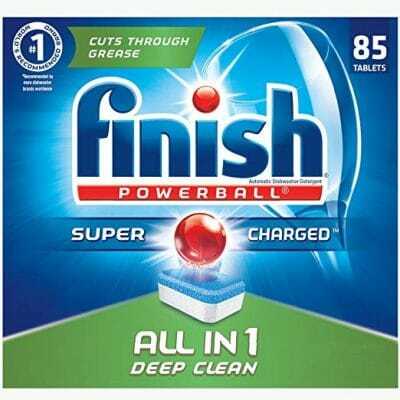 Dishwasher tabs like Finish Powerball gives you the power of liquid and powder. For further assistance with your dishwasher or other appliance contact Ceasar’s Appliance Service today! 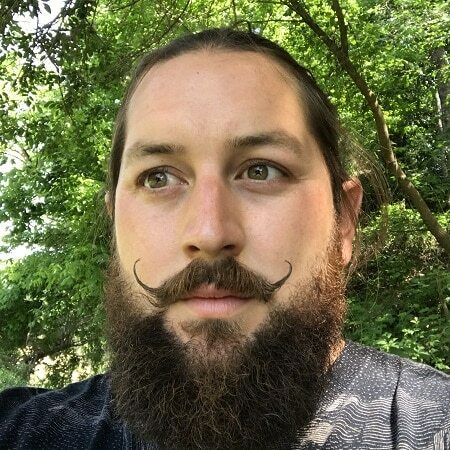 Andrew has been a part of the appliance repair industry for many years, and possesses a wealth of knowledge when it comes to repairing all major home appliances. He's a big part of what makes Caesar's the top appliance repair company in Orange County.